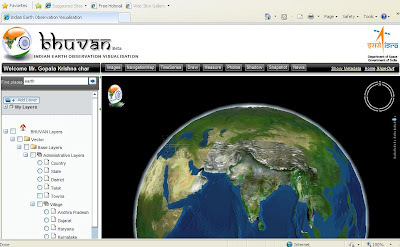 Bhuvan, (Sanskrit: भुवन, lit: Earth), is a satellite mapping tool similar to Google Earth and Wikimapia. It was developed by Indian Space Research Organisation (ISRO). It offers resolution up to 5 metres and is considered as a rival to Google Earth and Wikimapia. A prototype (beta)of this application was launched on 12th August 2009. A Geoportal of Indian Space Research Organisation showcasing Indian Imaging Capabilities in Multi-sensor, Multi-platform and Multi-temporal domain. The portal gives a gateway to explore and discover virtual earth in 3D space with specific emphasis on Indian region. To browse Bhuvan, you require the Bhuvan Plug-in which can be downloaded from this website, after registration and you will also need DirectX 9.0 or higher version (www.microsoft.com/windows/directx/) and MS .NET framework 2.0 or above for installing the plug-in. Please note that the Bhuvan Plug-in can be installed with administrative privileges only. Video in print - Can you Believe it? OMG! I can' stop laughing!